The Gold Austrian Philharmonic is Europe’s most popular coin. Originally introduced with a 1 oz and ¼ oz weight available, the program has expanded multiple times during its history to include various fractional-weight coins. Right now, the latest coin added to the series is available on Silver.com with the addition of the 2016 1/25 oz Gold Austrian Philharmonic coin. 3rd annual striking of the 1/25 oz Gold Philharmonic. Arrives in a protective plastic slab. Consists of one-twenty-fifth troy ounce of .9999 pure gold. Bears a face value of €$ (Euros) backed by the Austrian government. Features images inspired by the Vienna Philharmonic orchestra. Designed originally by Thomas Pesendorfer. Each 2016 1/25 oz Gold Austrian Philharmonic coin in this Silver.com product listing is available to you as a Brilliant Uncirculated specimen. Coins in this condition exhibit no signs of wear and tear, however you may notice breaks in the luster, spotted surfaces, or contact marks from the striking process. 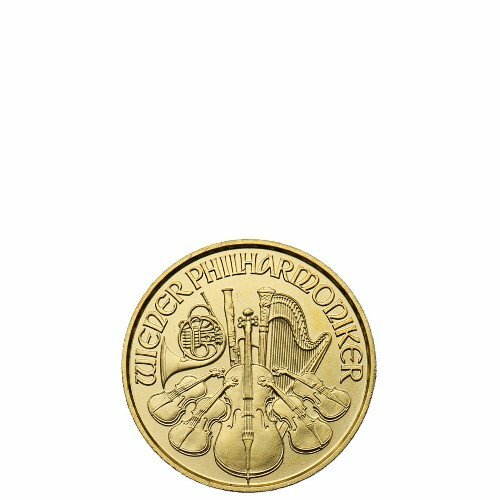 Gold Austrian Philharmonic coins were first introduced in 1989 as a 1 oz and ¼ oz bullion coin. The coin series expanded in 1991 to include a 1/10 oz coin, while a ½ oz specimen was added in 1994. 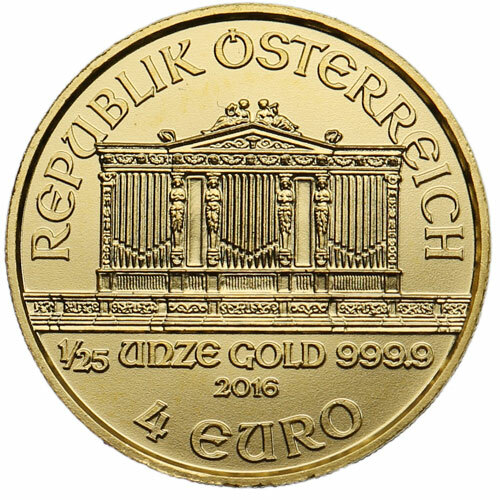 The 1/25 oz Gold Austrian Philharmonic was unveiled in 2014 on the 25th anniversary of the coin’s introduction. On the obverse of the coin is the Great Organ from the Golden Hall in the Inner Stadt neighborhood of Vienna, the national capital. This concert hall, also known as the Musikverein, is the home theater of the Vienna Philharmonic orchestra. 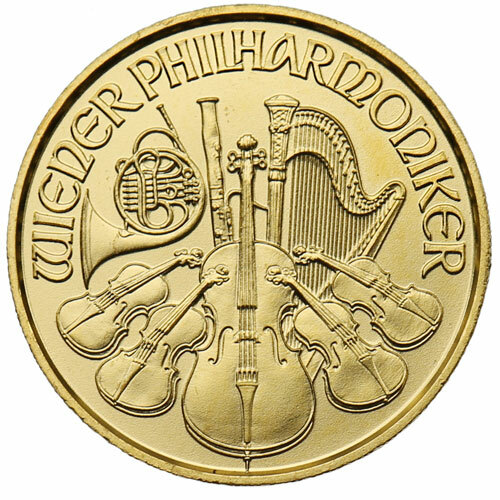 The reverse face of the coin includes a cornucopia of musical instruments, and each represents an instrument used by a member of the orchestra. You’ll find a French horn, bassoon, harp, and four violins included in the design, all of which are centered on a cello. Engravings featured on both sides of the coin are written in German, which is the official language of the nation of Austria. These coins are minted on an annual basis at the Austrian Mint, which was founded in 1194 by Duke Leopold V. The 1/25 oz. coin from the Austrian Mint was originally intended for use only in 2014, but its popularity has led to repeat production in 2015 and now 2016. If you have questions, please feel free to contact Silver.com at 888-989-7223, connect with us online via our live chat, or email us.